Thought I'd show some of my recent build projects. Started out with my build of the "Aces High" spitfire last November. So here goes my stab at the Village at 1/72 scale. Don't know what the scale for the English Village was originally. But it was still nice of somebody in Germany to preserve this bit of advertising history on the Internet. Also found the "Good Views" Bus so it sort of goes along with the time period. Did a recolor/redraw of it so the driver's wheel and seat would be on the right side of the bus. I have the Kellogs Village but have not printed it out yet. For what it is - something off a Cornflake Packet I think the artwork and the models are suprisingly good and well worth the effort. I like your builds - they have come out very nicely. And the bus was a great idea as well. When you have finished a small base and a bit of vegetation would make a really outstanding model! the ruler tool shows that the scans appear to be 1/2" to the foot, or 1/24th scale. I was surprised that the reduction to 1/72 came out so well. Some of it is because of using the HP color printer at my public library. There are 3 more buildings to go, school, church, and petrol/service station. All together they should make a nice set up for my train layout. The Spectrum cable co. sent a application for television service, so after opening the envelope the insides looked similar to "cobble stones". Hope they send again so I can get more for free! If not I can scan this one. back of the grocery/butcher shop awaiting to make the rounds of the village. 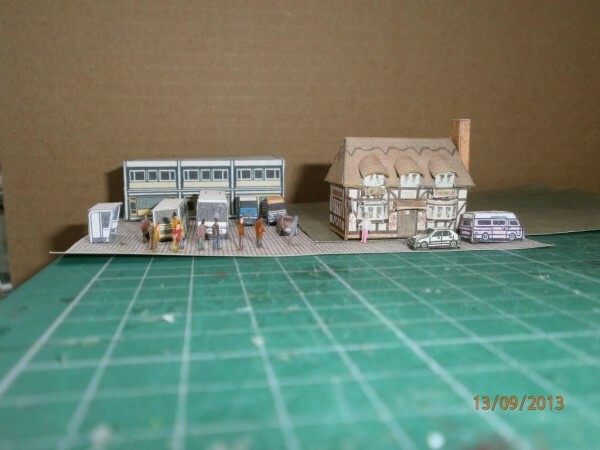 Long time ago now, I was working on a medieval town model (That I still haven't finished) and I wanted a more modern pub to go outside by the car park. I tried shrinking a few different ones (I think it was 1:200 scale, but may be 1:300) but the best shrink turned out to be the simple Kellogg's model. One day I hope to build the rest of the village too, but then again ... one day I hope to finish the Medieval Town too. These look like something fun to add to the village. building to be assembled easier...the service garage and gas station. I need to color the windows of the fuel lorry in Photoshop. The village is really coming along. I like the inn and the bus especially. The car looks like an MG TD but it is probably something else. I think the TD may be too modern for the time period? The MG TA came out in 1935 or so. It looked just like the TC which was the prcdecessor of the TD. Snagged these three. Thanx. My poor build list is getting sooo overweight. Neat buildings! Thanks for showing casing them. I decided that I needed a copy and tracked them down from the starting point provided on this thread. And thanks for the vehicles.